Good. 0744512301 ALL BOOKS SHIPPED WITHIN 1 DAY OF PURCHASE! John Lawrence. Very Good. 4to-over 9¾-12" tall. 1st Printing. First edition. first printing Quarto hardback. 32 pages Colour illustrated. Lacks end papers otherwise very good condition. No inscriptions. Lawrence, J. Very Good. Emily's Own Elephant by Pearce, Philippa, 1989-05-25. 32 p. Illustrations. Intended for a juvenile audience. Lawrence, J. Good. 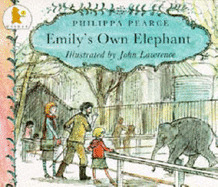 Emily's Own Elephant by Pearce, Philippa, 1989-05-25. 32 p. Illustrations. Intended for a juvenile audience. Good. 0688076785 Ships from Tennessee, usually the same or next day. Illustrated by John Lawrence. Fine in Very Good+ dust jacket. 0688076785. Nearly new book. Crisp clean bright. No marks. Dust jacket has corner price clipped else very good +. New protective cover. Fair. 0688076785 Ships promptly from Texas.